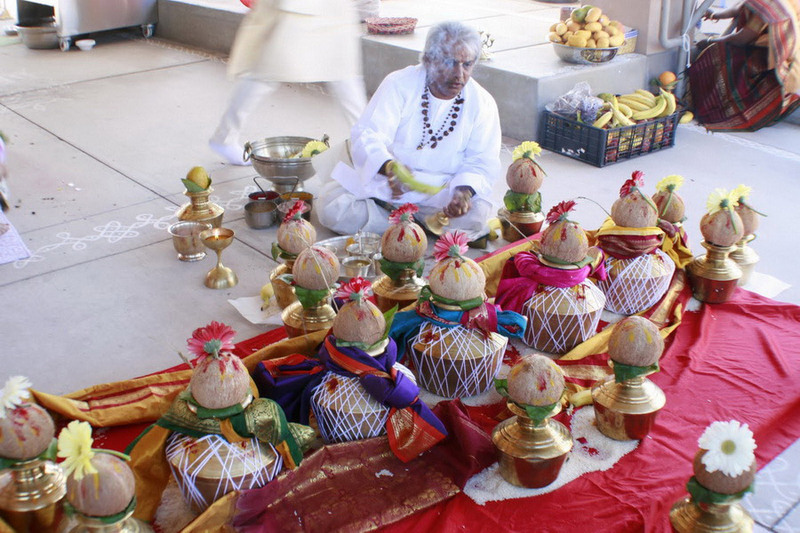 The Hindu Society of Nevada E-News letter is sent every month providing details of the activities scheduled at the Temple. The following is a list of Temple activities for the month of June 2010. We thank all Devotees, Sponsors and Volunteers for making the 9th Temple Anniversary a successfull event. We also thank the Sindhi Community and VETA (Vegas Telugu Association) for preparing food for 250 and 500 devotees respectively. We are especially thankful to our Panditji Sri Gopalakrishna Panchangam and his assistants Sri Chalapathi Samudrala and Sri KM Narayanan for performing the Sri Lakshmi Narayana Havan with great austerity. We had a total of 53 sponsors and were able to collect donations in the amount of $27,853. Expenses for the event were $4,821. Net proceeds to the Temple from this event was $23,032. Ash from the Havan and Kumkum from the Pooja is available at the Temple for all devotees. Anniversary pictures have been loaded to the Temple website. Please click here for the 9th Anniversary message from the Board of Trustees detailing the current 'Status' of the Temple and 'Future' projects and tasks. A Bhartanatyam dance performance by students of Charulata Jayaraman (Irvine, CA) will take place at the Temple on June 19th. Please note that if you wish to schedule a classical event in the Temple, you can do so by donating an amount of $251 for use of the Premises. Please click on the link below for information on this dance performance. June 7, 14, 21, 28 (every Monday) - 10:30 am - 11:30 am. The term of the current Executive Committee will expire on July 31st, 2010. We are looking for Volunteers who are willing to serve the Temple for the term August 1st, 2010 - July 31st, 2012. The following positions are open for Volunteers - President, Vice President, Secretary, Assistant Secretary and Treasurer. This is a Temple for the Community and preference will be given to new qualified volunteers for these posts. Each and every person in this community will have an opportunity to serve the Temple if they so desire. Please contact any member of the Selection Committee listed below if interested. The last date to file your nomination is June 30th, 2010. Selection Committee: Rao Gondy (813-8900), Ramesh Piplani (445-4223) and Nirmalya Chatterjee (837-0738). New Temple website is up and running. Please visit the redesigned Temple website at www.hindutemplelv.org. We thank our web master Mr. Sanjay Palherkar for spending an enormous amount of time in this redesign effort. We plan to add additional enhancements in the coming months to automate the process of registering your address and e-mail information, payments, dynamic view of Temple calendar, etc., Please e-mail your comments regarding the redesign of the temple website to contactus@hindutemplelv.org.